If you’re anything like me, you’ll have lots of lovely mincemeat left over from all those mince pies you’ve been making, so here’s a good idea for what to do with it. Have a yummy Christmas! 1. Heat the mincemeat until it’s nice and hot in the microwave. 2. Heat the pancakes in the microwave for about 2 minutes until all of them are warm. 3. 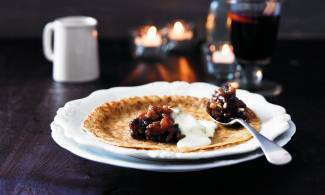 Spoon some mincemeat on to each pancake, add a dollop of brandy cream and enjoy. Don’t forget the mulled wine.